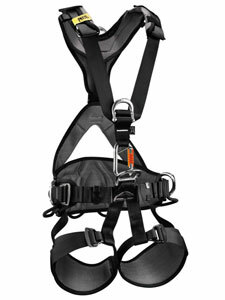 We are pleased to have received stock of the long awaited international version of the Petzl Avao full body harnesses. The international versions use a triact (triple action) karabiner to make the connection between the top and bottom sections of the harness, and this makes them suitable for the renewables industry as a wind turbine harness. Their ANSI rating also means they can be used in the US. Petzl Avao Wind Turbine Harness? Both harnesses are based on the standard Petzl Avao Bod harness but are the international version so feature fall indicators (as well as the triple action karabiner connecting the top harness to the sit harness). The Avaos are suitable for all types of work: work positioning, work restraint and fall arrest.